The laboratory is a member of the Association of Czech Test Facilities and Laboratories, and is authorized to use the association's stamp. Based on inter-laboratory comparison of the results of spectral analyses, the laboratory has received a Certificate of Competence. The LabTest 4.100.SP1 is a universal 4th-generation testing machine for both static and dynamic tension, compression, and bend testing. It complies with ČSN EN ISO 7500-1, ČSN EN ISO 6892-1, and other international standards for test machines. Its 100 kN rated loading makes it possible to test all metallurgical products sold by Ferona, a.s.
its software includes data transmission, machine control, graphic recording during testing, a table of measured values, and static calculation. The SW also makes it possible to produce a test report that includes the measured data including chemical analysis and measured hardness of material. Rods and sections, min. length 300 mm. 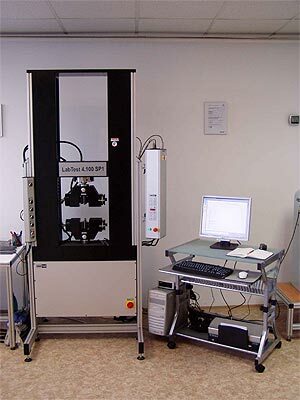 The HPO 250 durometer measures material hardness using the Brinell and Vickers method. 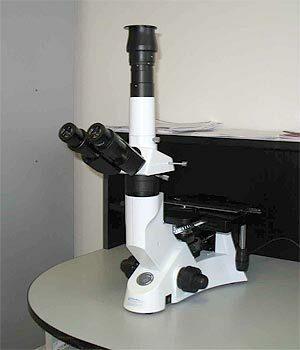 It features semi-automatic optical measurement of impression size using a CCD camera and image analysis. 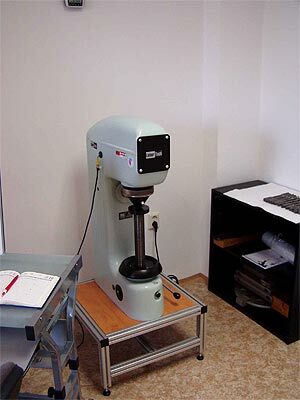 The modernized apparatus fully complies with ČSN EN ISO 6506-1, -2, ČSN EN ISO 6507-1, -2, and other international standards for hardness testing. An integral part of the durometer is software for hardness testing of materials that supports ČSN, EN, DIN, and ASTM standards and other standard industrial test methods. It provides a graphical record of the test, a table of measured values, and static calculations, and allows collection and static evaluation of data, which can be stored on a local or network disk. A material sample on which an area of at least 20 mm in diameter can be ground down. 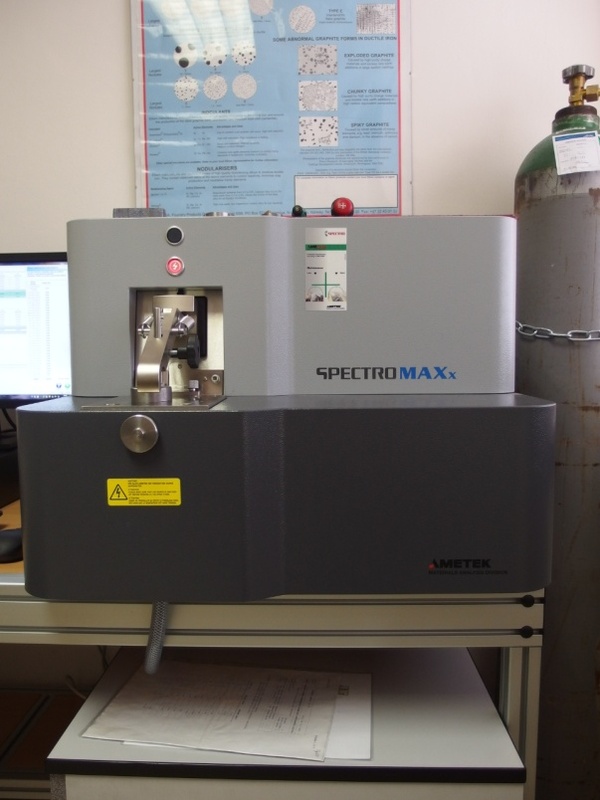 The PECTROMAXx M6 is a fixed device that performs non-destructive chemical analysis of basic materials: Al, Cu, Fe, Mg, and their alloys. C, Mn, Si, P, S, Cr, Mo, Ni, Al, Zn, Mg, Co, Cu, Nb, Ti, W, Pb, Sn, As, Zr, B, Fe, N.
A material sample on which an area of at least 15 mm in diameter can be ground down. For example sheet metal measuring at least 50 x 50 mm, a rod at least 40 mm in length, etc. 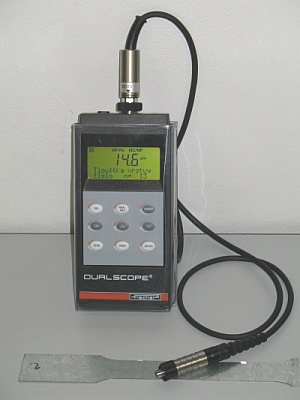 If needed, we can perform an analysis on the customer's premises using a mobile spectrometer. The price of this service is quoted individually, depending on distance and other conditions. The Mitutoyo SJ-301 is a portable surface roughness measuring instrument that can measure surface structure and characterize it using a number of parameters according to various domestic and international standards. Measurement results are displayed digitally and in graphic form, and can be printed on a built-in roll printer. Measurement range: 300 μm (±150 μm) or 12 000 μin (±6000 μin). The MTM 400 metallographic microscope can be used to examine the crystalline structure or microscopic surface defects of materials. The instrument is equipped with a set of interchangeable lenses (PL4/0.10, 10x/0.25, 20x/0.40, 40x/0.65) and a camera that transmits the image to a PC, where it can be stored, printed, or edited and saved in JPG format. This instrument uses either magnetic induction (to for example measure zinc, tin, chrome, copper, paint, and plastic layers on steel or iron) or eddy currents (to for example measure elox, paint, varnish, and plastic layers on aluminium, copper, and other non-ferrous metals). 0 – 1200 μm – eddy currents. Test samples must be indelibly marked so they can be uniquely associated with information provided in an order or list. type of test(s) required (tensile, chemistry, hardness).